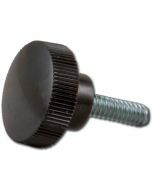 Stand mounting knob for several Lowel lighting fixtures including the DP Light, Light-Array, & Softlight 2. Also used in the Full Pole (KP), Half Pole (KPH), Interlink (K1-10), Ceiling Link (KCL), & Grip (KG). 1.25" x 1.25" x 1.8"